A panel of industry leading judges praised all the entries to the international competition across six categories as ‘outstanding’, saying the high quality and variety they’d seen made choosing a winner particularly difficult. 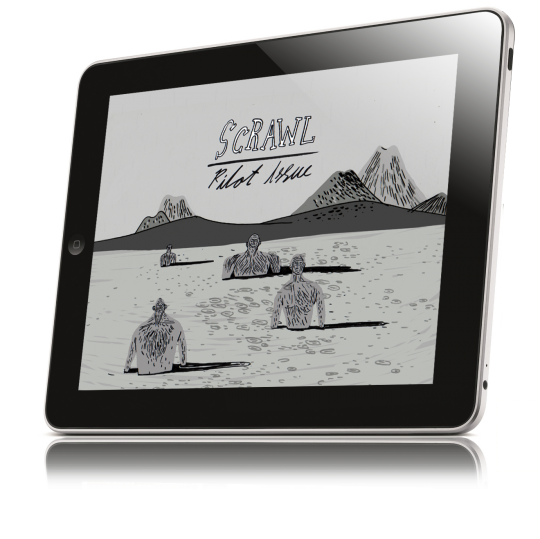 Scrawl’s creators take home US$5,000 as “Best in Show”, as well as US$1,000, having also won in the Comics category. The app’s stunning visuals are a testament to its illustrators. It is also the first example of a magazine created with mag+ that uses iPad’s tilt function, and takes advantage of tap navigation, guiding readers chronologically through the comic. An interview with Michael Golan and Roni Fahima express their view of how to create a magazine for iPad. Best in Category winners also take home US$1,000 each. They will also feature in the next mag+ advertising campaign and are showcased on Magplus.com for the remainder of 2012. • Editorial: This competitive category was won by RedEye for iPad – a Chicago newspaper from Tribune Group, turned digital. Packed full of bonus materials, the app allows for readers to choose which stories to explore. • Music and Movies: Hash magazine created their app using embedded playlists to its advantage with seamless audio and video integration, showcasing eclectic musical talent. • Books: Wootini is a colourful children’s book which stole the show; full of illustrations and simple, but thoughtful interactivity. • Brochures/Catalogues: Hi Hirvi, a creative t-shirt brand, showcased a unique design pattern, and used click through in-app purchasing links. • Self-Promotion: J3Z:SE featured unique cut-out layering with their stunning photography, allowing readers to view whole or templated images from this photo studio. • People’s Choice: The horizontally designed Zone Blitz iPad magazine used creative layering, interactive pop-ups and borderless high-res images, bringing football to life and winning the public vote. Members of the judging panel included the Senior Art Director of How Magazine, the Chief Creative Officer at Great Works, and the Editor in Chief of American Photo. “It’s great for all the shortlisted entrants to get this kind of industry exposure for their work. We are committed to opening up digital publishing opportunities, and this shows how great design can come from anywhere,” says Kazarnowicz. Last year’s mag+ app design competition winner even landed a job a creative agency in New York; so watch this space.